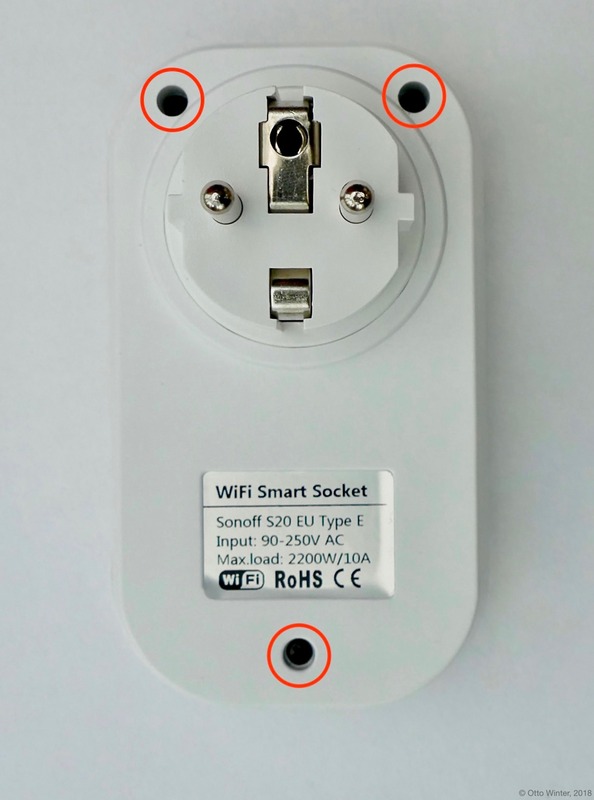 ESPHome can also be used with Sonoff S20 smart sockets. These devices are basically just an ESP8266 chip with a relay to control the socket, a small button on the front and a blue and green LED light. 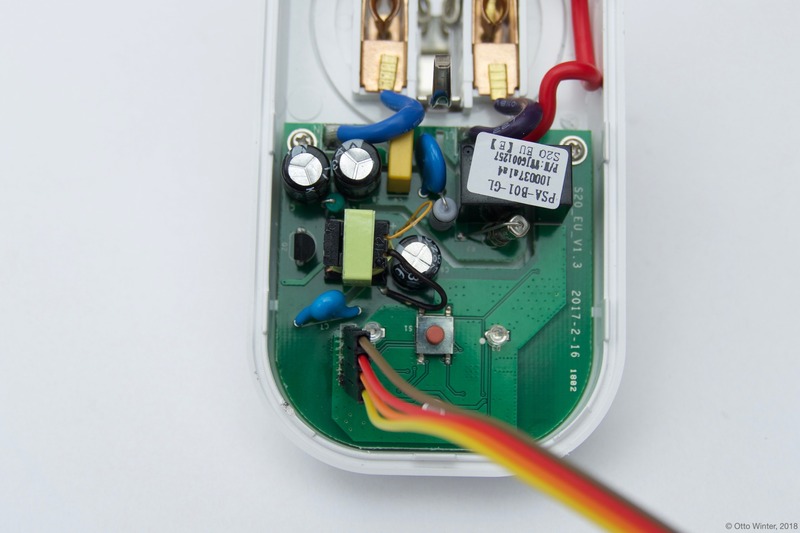 This guide will step you through setting up your Sonoff S20 and flashing the first ESPHome firmware with the serial interface. After that, you will be able to upload all future firmwares with the remote Over-The-Air update process. If you’ve previously installed Sonoff-Tasmota on your Sonoff S20, you’re in luck 😀 ESPHome can generate a firmware binary which you can then upload via the Tasmota web interface. To see how to create this binary, skip to Step 3: Creating Firmware. An USB to UART Bridge for flashing the device. These can be bought on Amazon for less than 5 dollars. Note that the bridge must be 3.3V compatible. Otherwise you will destroy your S20. Computer running ESPHome Hass.io add-on. Screwdriver to open up the S20. Soldering iron and a few header pins to connect the UART interface. The first step is to open up the Sonoff S20. 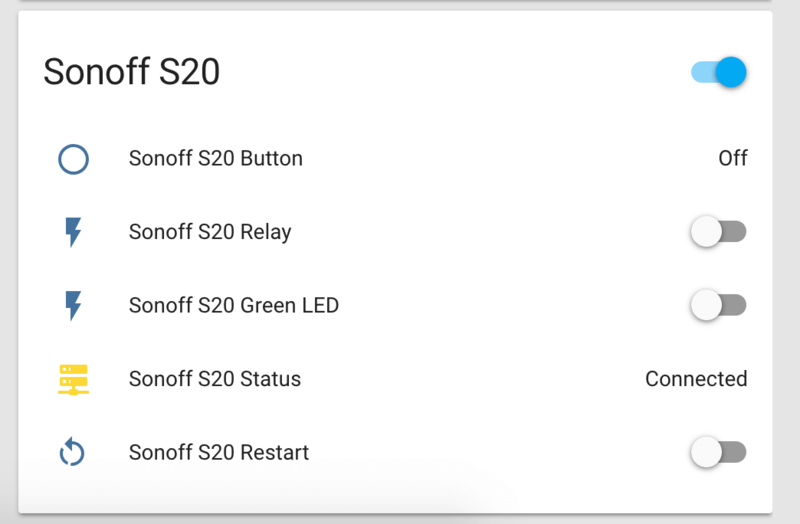 Note that you do not have to run the original firmware supplied with the Sonoff S20 before doing this step. While the device is not plugged in, turn the back side so it’s facing you and unscrew the three black screws holding the back of the case together with the front. There are three screws on the back of the Sonoff S20. After that, you should be able to remove the front cover and should be greeted by a bunch of parts. We’re interested in the main part of the S20 with the green PCB. On the bottom of the PCB, you will find four unpopulated holes. These pins have the UART interface used to flash firmwares onto the device and debug issues. The UART interface of the Sonoff S20. So, in order to flash our own custom firmware, we’re going to need to somehow connect the UART to USB bridge to these pins. The only way to make a good connection here is by using a soldering iron and soldering on some pin headers. 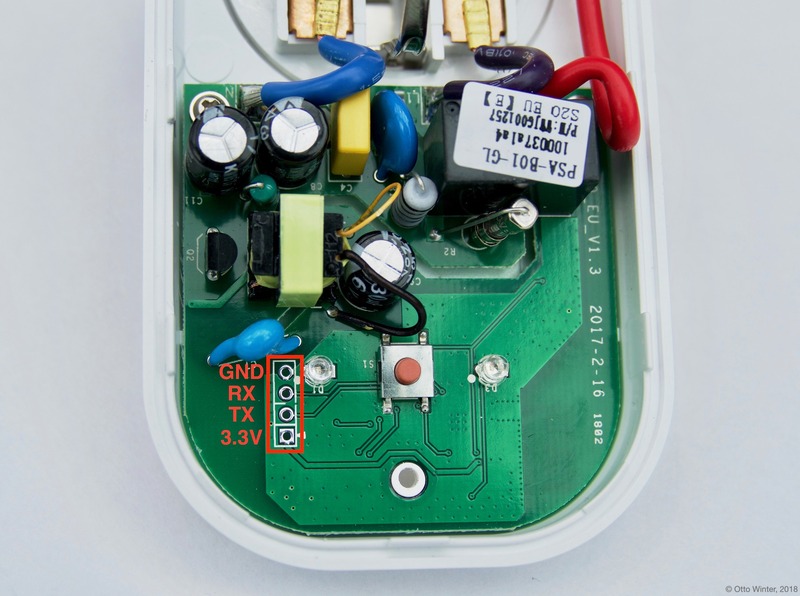 On older models of the Sonoff S20, you were able to get the whole PCB out. Newer versions, however, glue the PCB onto the case to avoid people flashing custom firmwares. If the latter is the case, you will need to just solder the pin headers from above - it’s a bit difficult, but possible. Now go ahead and connect the pins to your UART bridge, making sure the S20 is not plugged in as before. Also beware that some UART to USB bridges supply 5V on the VCC pin if it’s not explicitly labeled 3.3V. It’s best to just use a multimeter and double check if it’s unclear. On some older S20s, the RX and TX pins are swapped (sometimes even the written silkscreen is wrong). If your upload fails with a error: espcomm_upload_mem failed message it’s most likely due to the pins being swapped. In that case, just swap RX and TX and try again - you won’t break anything if they’re swapped. The Sonoff S20 is based on the ESP8266 platform and is a subtype of the esp01_1m board. With this information, you can step through the ESPHome wizard (esphome sonoff_s20.yaml wizard), or alternatively, you can just take the below configuration file and modify it to your needs. Now run esphome sonoff_s20.yaml compile to validate the configuration and pre-compile the firmware. In order to upload the firmware, you’re first going to need to get the chip into a flash mode, otherwise the device will start up without accepting any firmware flash attempts. To do this, while the device is UART bridge is not connected to your USB port, start pressing the small push button in the middle of the PCB. Then plug in the UART bridge into your computer and just keep holding the button pressed for 2-4 seconds. The S20 should now be in a flash mode and should not blink with any LED. Hooray 🎉! You’ve now successfully uploaded the first ESPHome firmware to your Sonoff S20. 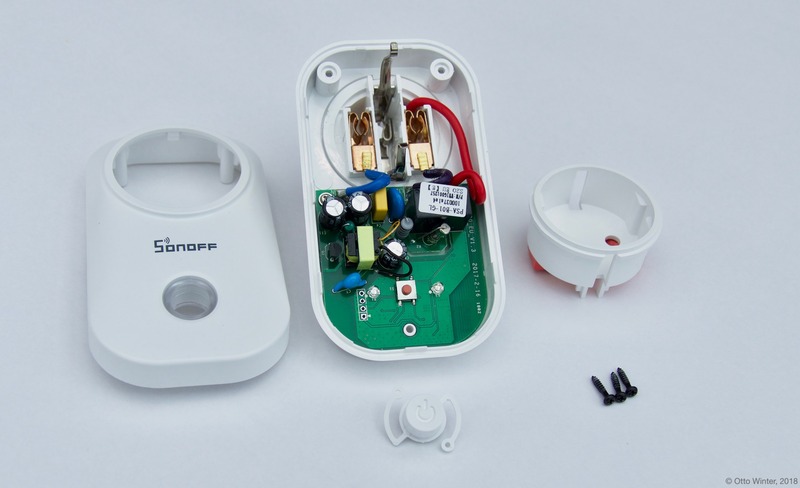 And in a moment, you will be able to use all of ESPHome’s great features with your Sonoff S20. Sometimes the UART bridge cannot supply enough current to the chip to operate, in this case use a 3.3V supply you have lying around. A nice hack is to use the power supply of NodeMCU boards. Simply connect 3.3V to VCC and GND to GND on the pins. Do not attempt to plug the device into a socket to overcome this problem while troubleshooting. Now we would like the S20 to actually do something, not just connect to WiFi and pretty much sit idle. Below you will find a table of all usable GPIO pins of the S20 and a configuration file that exposes all of the basic functions. name: "Sonoff S20 Green LED"
Above example also showcases an important concept of esphome: IDs and linking. In order to make all components in ESPHome as much “plug and play” as possible, you can use IDs to define them in one area, and simply pass that ID later on. For example, above you can see an PWM (dimmer) output being created with the ID s20_green_led for the green LED. Later on it is then transformed into a monochromatic light. 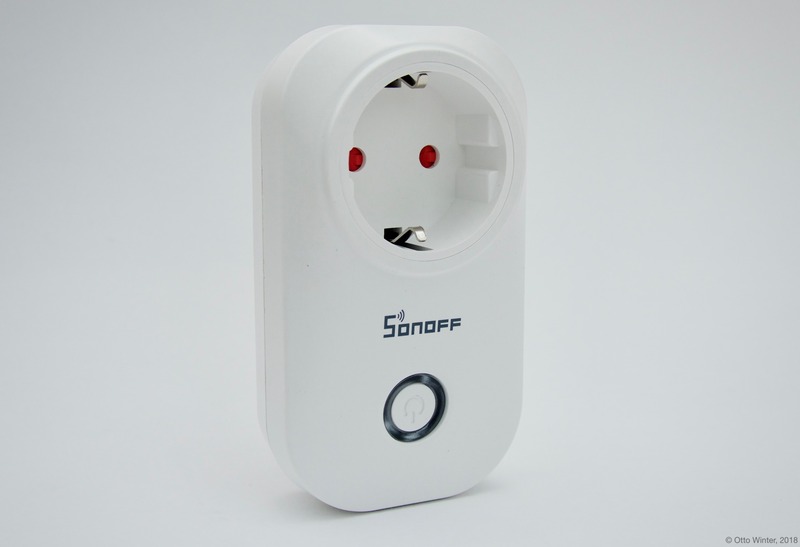 To make pressing the button on the front toggle the relay, have a look at the the complete Sonoff S20 with automation example. Now you’re pretty much done with setting up the Sonoff S20. The only steps left are to remove any cables within the housing and make sure everything in there is clean. If, for example, you used wires to connect the UART console, you should definitely remove them to avoid a short with mains. Sometimes the soldered-on header pins can also interfere with the button. It’s best to remove the header pins again, as you will hopefully not need to use them again because of ESPHome’s Over-The-Air Update features (+ the OTA safe mode; if your node reboots more than 10 times in a row, it will automatically enter an OTA-only safe mode). If you’re sure everything is done with the S20 and have double checked there’s nothing that could cause a short in the case, you can put the front cover with the button on the base again and screw everything together. Now triple or even quadruple check the UART bridge is not connected to the S20, then comes the time when you can plug it into the socket.